Please give us any details to customize your part. If you don’t see the option you want, please call us. We offer many custom options. Spira’s EMI-Only Connector-Seal gaskets are designed to provide an EMI seal in flange-mounted connectors for the life of a system. These gaskets are extremely durable, and have achieved up to 1,000 insertions in actual use. Note that the dash numbers and sizes are different for each type of Connector-Seal gasket: the Environmental Connector-Seal Standard-Mount (ECS), the Front-Mount Environmental Connector-Seal (FMECS) and the EMI-Only version (CS). The “CS” EMI-Only Connector-Seal is a more durable, cost effective replacement of Spira’s original Connector-Seal (“SSCG”) and can be either back or front-mounted. The CS EMI-Only gasket is similar to the EMI & Environmental Connector-Seal (ECS), but due to frame dimensions it does not provide environmental sealing. When choosing a gasket, select an inside diameter that easily clears the connector barrel. The shielding is achieved by making contact between the two joint surfaces, not by touching the barrel. The original SSCG gaskets can still be ordered if desired. CS Frame: Silicone (/S) or Fluorosilicone (/F) sealing over a stainless steel frame. CS Spiral: Spira-Shield standard force tin/lead plated beryllium copper. 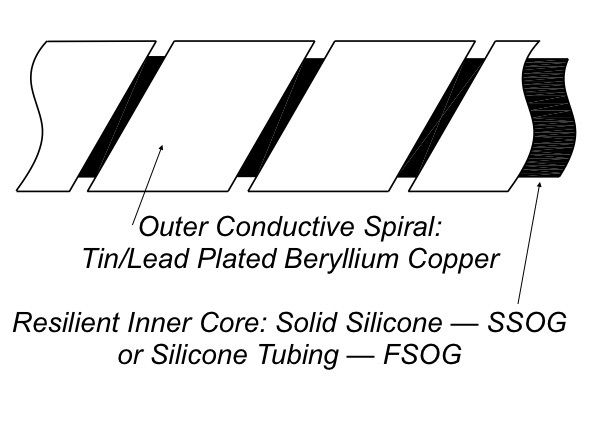 SSCG Spiral: Enduro-Shield moderate force tin/lead plated beryllium copper. SSCG Core: Cured silicone adhesive. RoHS compliant options are also available. Connector-Seal gaskets offer shielding quality from 116 to 152 dB. The level is dependent on contact surfaces and may vary depending on your specific application. Refer to our Shielding Quality charts for more complete performance data. Optimal compression of the gasket is 25% of the diameter of the spiral. The compression force stated is approximate. When installing the gasket, care must be taken to clear the mounting pins one at a time. CS Series: ~30 pounds per linear inch compression force required. SSCG Series: ~10 pounds per linear inch compression force required. The frame on our CS series gaskets is stainless steel sealed on both sides by silicone or fluorosilicone elastomeric material. The SSCG series gaskets have a chem-film plated aluminum frame. The CS gaskets are still EMI-only protection due to the sizing. EMI & Environmental Connector-Seal gaskets are ordered by the piece. Not all configurations are stock items. Custom sizes are also available. Contact us for availability.